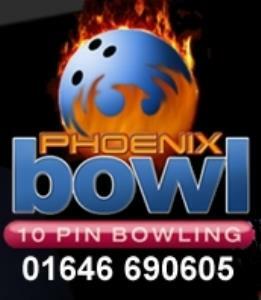 Phoenix Bowl Ten Pin BowlingPhoenix Bowl offers entertainment and fun regardless of age or ability, this ten-pin bowling centre is one of Milford Marina’s most recent and lively attractions. Along with a sophisticated ten-lane set up, the centre also boasts a separate pool-room for those with endless amounts of energy. If this all sounds a little too active and spectating is more in your league, then enjoy the action from the comfort of the fully-licensed bar complete with big screen coverage of major sporting events, or our highly acclaimed restaurant that has a growing reputation for flexibility. There is also an indoor soft play area for young children. Enjoy a game of bowling at Phoenix Bowl ten pin bowling alley in Milford Haven. Shoe hire is included in all our prices. £22.00 per hour, per lane. Maximum of 6 persons per lane. Socks must be worn with all House Shoes. Socks can be provided at £1.00 per pair. Follow The main road through Milford Haven. There is only one roundabout. If coming from Haverfordwest take the 2nd exit, turn left before tesco petrol garage and left again within a few yards. If coming from Dale side Take the first exit at the roundabout and follow as above.